Lamb chops with pasta makes for a tasty and rustic dish that you can throw together in no time. 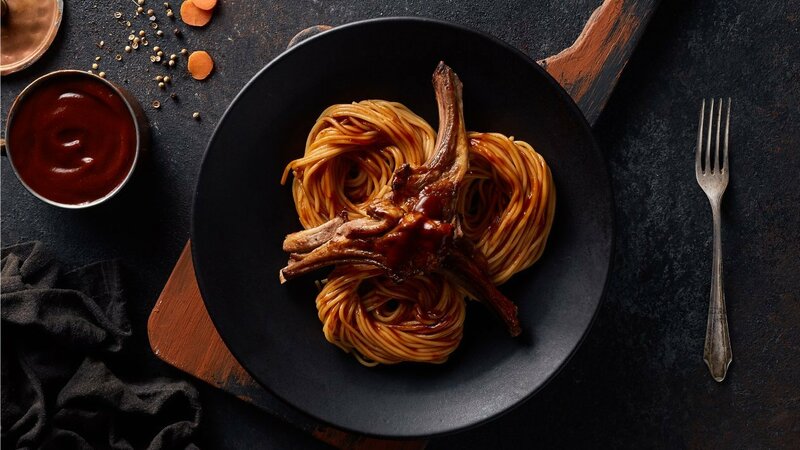 While you might think lamb is a big undertaking, pairing it with pasta and using chops save much time and labour. Full recipe available here! In a large cooking pot warm olive oil over medium heat, add lamb chops and cook for 2 minutes on each side. Remove chops and set aside. In the same cooking pot over low-medium heat sauté onion, carrot and celery until onion is translucent and soft. Add garlic and chopped herbs fry for 1 minutes. Add the tomato paste, cook for a further 2 minutes, stirring often. Add salt and black pepper, return chops and cook for another minute or so, again stirring often. Add water and Knorr Demi Glace Base increase heat and bring to simmer allow to cook for 10 minutes before. Add chickpeas to the mix, add the pasta and cook for about 3 minutes.